Davidovich Bakery branded franchise ads have been running on Craig’s List for nearly a month. The text and contact information is the same as that used by the NYC Bagel scam. Davidovich Bakery’s Marc Fintz denies any involvement with the ads. Why does Davidovich Bakery allow the scam ads continue to run with their name, logo and store photo? They are also the bagel supplier of choice for Joe Smith’s NY bagel scam. Davidovich Bakery principals Gene Davidovich and Marc Fintz are well-aware of the illicit and predatory conduct of Joe Smith, Dennis Mason & the NY Bagel Scam (aka NYC Bagel & Sandwich Shop Scam). We have made sure of that. Up until now, we have assumed that they just looked the other way and didn’t care that their bagels were being used as a prop to destroy individuals and families across the country. However, the dozens of Davidovich NYC Bagel Franchise ads on Craig’s List – and Marc Fintz’s apparent unwillingness to demand their immediate removal – have us wondering. The NYC Bagel & Sandwich Shop logo has been adulterated to include the trademark-protected Davidovich Bakery logo. This is the Hottest New Franchise Available for a limited time only, an exceptional Fall Special 2018 program within the [LOCAL MARKET NAME] areas. SITES AVAILABLE NOW !!! For full details, call Franchise Dept. toll free at; 833-372-2740, 7 Days a Week. 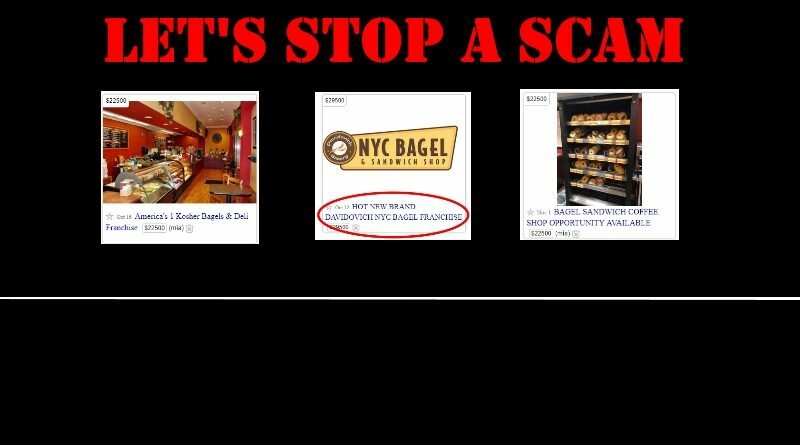 There is one major difference between the hundreds (literally) of “NYC Bagel & Sandwich Shop” scam ads running on Craig’s List and the “Davidovich NYC Bagel Franchise” ads. The Davidovich Bakery-branded ads cite a $29,500 franchise fee – $7,000 greater than the non-Davidovich ads. In the past, NY Bagel scammers Dennis Mason & Joe Smith have enticed franchisees with the offer of a $7,000 commission/referral fee? Marc Fintz did not take kindly to the inference that Davidovich may be getting a cut of the spoils – and there is no hard evidence of it – but the fact that is has been 23 days that Davidovich has allowed these ads to run without (to our knowledge) demanding they be taken down is curious and troubling. 16 ads for the “Davidovich NYC Bagel Franchise” appear to have been posted October 12, 2018. We notified Marc Fintz and Gene Davidovich 4 days later on October 16, 2018. We are not a Registered Franchisor and we have no ads for the solicitation of Franchisees directly through our company. I am reviewing shortly. Thank you for your inquiry. I am aware of your work and believe we have communicated on these issues previously. We are a supplier. (PERIOD) (EXCLAMATION POINT). As a company that values it’s intellectual property and has spent time and money developing it we have NUMEROUS instances of violations from logo to slogan to photos. These are all dealt with in accordance with a similar protocol. While I am not at liberty to fully disclose all that occurs I have tried to re-emphasize that we address and take the matters seriously. You reference a “Davidovich Franchise Department Phone Number”. No such number has any affiliation with us whatsoever. Furthermore, IU never met, spoke to, emailed with or have any idea who DENNIS MASON is, or if he is even real. I believe I have mentioned this in prior communication. As for the concerns you have expressed I can only, at this point, indicate that they do not fall on deaf ears and are being addressed. 3. Every colluded with, conspired with, or partnered with any party to establish any business that wasn’t completely LEGALLY established and accounted for. It simply is not how we do business. Marc Fintz Could Have Ads Pulled With One Phone Call. Why Hasn’t He? It’s now November 8th, nearly a month after 16 supposedly unauthorized ads began running for the non-existent “Davidovich NYC Bagel Franchise,” and they are still running. If Davidovich Bakery intellectual property has indeed been hijacked by a customer and used without their permission, why hasn’t Marc Fintz or his attorney picked up the phone and demanded that they be immediately removed? It takes, literally, seconds to remove a Craig’s List ad. Why has Marc Fintz, Gene Davidovich and allowed these ads to seemingly go unaddressed? One possible explanation is that they are building a legal case against Joe Smith & the NYC Bagel Scam. That seems unlikely as they have never uttered a negative word about their long-time client. Marc Fintz calls that insinuation “borderline libelous” and denies it. Another explanation is that Marc Fintz, Gene Davidovich and Davidovich Bakery simply don’t give a damn. Don’t give a damn about the use of the company name, trademark and reputation. Don’t give a damn about the victims of the Davidovich NYC Bagel Scam. And that as long as somebody’s buying their rock-hard, frozen, par-baked bagels, they really don’t care what they do.